At first glance it may seem that, for a seasoned pro, arranging time-tested standards for a jazz orchestra would be something akin to taking a leisurely stroll in the park. But consider this: countless other arrangers have seen things the same way, and those memorable refrains have been sliced and diced, remodeled and amended in almost every way possible. The challenge thus lies not only in placing notes and phrases in the proper order but bringing something fresh and appetizing to the table. 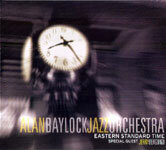 On Eastern Standard Time, the second album as leader of his own orchestra, Alan Baylock, chief arranger for the U.S. Air Force's leading jazz ensemble, the Airmen of Note, has unsheathed his pen and taken dead aim at nine popular and jazz standards. While his charts are by no means exotic, neither are they ever less than persuasive. Even though the nuts and bolts remain firmly in place, Baylock adds enough colorful accessories to make certain the listener's attention never wanders. Among those lending a sturdy hand in that department is the ABJO's special guest, the assertive Boston-based tenor saxophonist Jerry Bergonzi, who solos with customary vigor on Juan Tizol's "Caravan," Victor Young/Ned Washington's "Stella by Starlight" and Duke Ellington's "Warm Valley." As the ensemble is comprised of sidemen from the AoN, Army Blues and Navy Commodores, there's no letdown in expertise when Bergonzi isn't around. Indeed, the orchestra and its soloists are uniformly impressive (no pun intended). They include altos Antonio Orta and Andy Axelrad, tenors Joseph Henson and Luis Hernandez, baritone Doug Morgan, trumpeters Tim Leahey and Rich Sigler, trombonists Joe Jackson and Ben Patterson, pianists Tony Nalker and Harry Appelman, bassist John Pineda and drummer Steve Fidyk. Patterson is superb on his feature, "All the Things You Are," Axelrad and Leahey likewise on Cole Porter's "Love for Sale." Yes, you've presumably heard these songs before, but speaking for myself, it's always a pleasure to hear them again, especially when performed by an ensemble as sharp and dynamic as the ABJO. 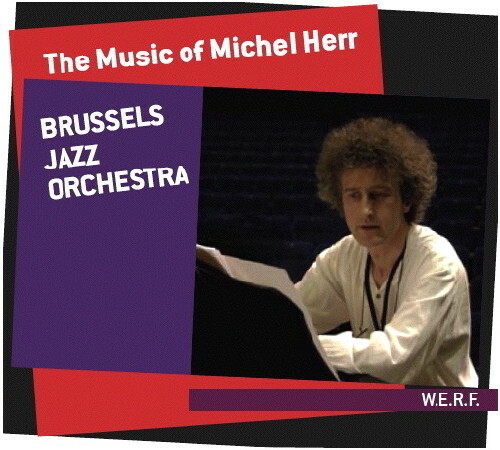 Composer / arranger Michel Herr has been writing for big bands for more than thirty years, and as this two-disc set by the world-class Brussels Jazz Orchestra affirms, he's pretty good at it. Not all of the music was written for the occasion; in fact, "Pentaprism," which closes Disc 2, is one of Herr's earlier compositions, inscribed in the mid-'70s for the ACT Big Band. Another of his essays, "Extremes," is the title selection from ACT's second album, while the "Celebration Suite" (much of it, anyway) made its debut on The September Sessions (De Werf, 1999). The colorful four-part "Celebration," whose third movement, "A New Page," has been added, is the first of two extended works on Disc 2. The more recently composed "Flagey, a New Era," also in four parts, is a stellar showcase for the talents of tenor saxophonist Kurt Van Herck, pianist Nathalie Loriers, trumpeter Jeroen Van Malderen, guitarist Peter Hertmans and alto Frank Vaganee. "Pentaprism," a loping flag-waver, is preceded by the graceful "Song for Micheline" (solos by Van Herck on soprano and flugel Pierre Drevet).